Build with Azure in mind, Retrace provides powerful application performance management for your developer teams and applications. CEO Matt Watson visits the Azure Podcast. Stackify has used Azure for nearly 5 years. We have been eating our own dogfood for a long time. If you want the best APM (application performance management) solution available for Microsoft Azure & ASP.NET, you are in the right place! Retrace works perfectly with multiple Azure deployment options. Getting started with Azure? Using the “Hybrid cloud”? If you are deploying a new application to Microsoft Azure and you aren’t sure how it is going perform, Retrace can help. Retrace can give you confidence that your application is working perfectly and your customers are happy. You can use Retrace to track all of your applications across all of your deployments, no matter where they are. Retrace works with Microsoft Azure, AWS, and traditional physical or virtual server hosting. If you have access to the server, then you can install Retrace on it. Retrace APM was built for the cloud, PaaS, and apps that scale. If your app scales up and down throughout the day or week, Retrace will work perfectly. We also bill by the hour so you only pay for what you use. Devs don't want Ops' job—they want theirs to be easier. Retrace enables developers to quickly find bugs and improve application performance on QA/test and production servers. Retrace provides developers with a solution specifically designed to give them the visibility, data, and actionable insights they want and need. Retrace is easy to install and use; it just works. Today's dev teams need a solution that's SaaS-based and ready to scale, so we built one just for them. See more with less effort. Retrace offers a single pane of glass for code performance and metrics, including integrated errors, and logs. Retrace works with most common app stacks and can even show things like which cache key is being used, names of queues, etc. Developer teams need access and visibility to code performance once it's deployed to a remote server or device. Retrace helps rapidly improve app performance by providing developers with greater visibility and access to their code once it's been deployed to a server. It also connects to Prefix, closing the loop on the entire application lifecycle. How is Retrace different than traditional APMs? They tell you if things are good, bad, or close to bad. But they fail at giving developers the details they need to really fix problems. Retrace was designed for developers. Retrace tracks deep level details about your application to help find and fix problems quickly. Retrace what your code is doing (or not doing). 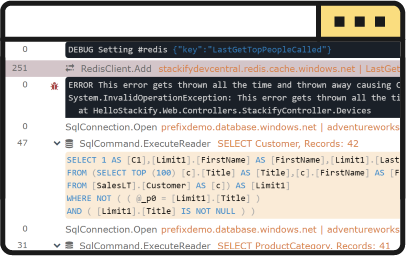 Retrace is the server-based component in Stackify's code lifecycle toolbox for developers. Tired of chasing bugs in the dark? Retrace automatically tracks key methods in common development frameworks. Combined with your application logs and errors, it is nothing short of pure genius. Finding application problems is easy with this level of detail! Try it today with Prefix for free on your dev box. Application problems are commonly associated with a specific dependency like SQL, NoSQL, Redis, or a web service. Retrace makes these sort of problems really obvious. Dozens of common libraries are supported. To view a complete list please visit our docs for .NET or Java. Retrace can aggregate all of your application and server logs. Advanced searching capabilities are supported to make troubleshooting bugs easy. Syslog, web server logs, Windows Events and app logs are all supported. App logs can easily be sent to Retrace via common logging frameworks like logback, log4j, log4net, NLog, and many others. Automatically identify new exceptions in your code, when they started, and how often they occur. Retrace uniquely identifies exceptions and can alert you when a new one occurs or error rates are high. If that wasn’t awesome enough, you can even view the full transaction trace collected by Retrace! 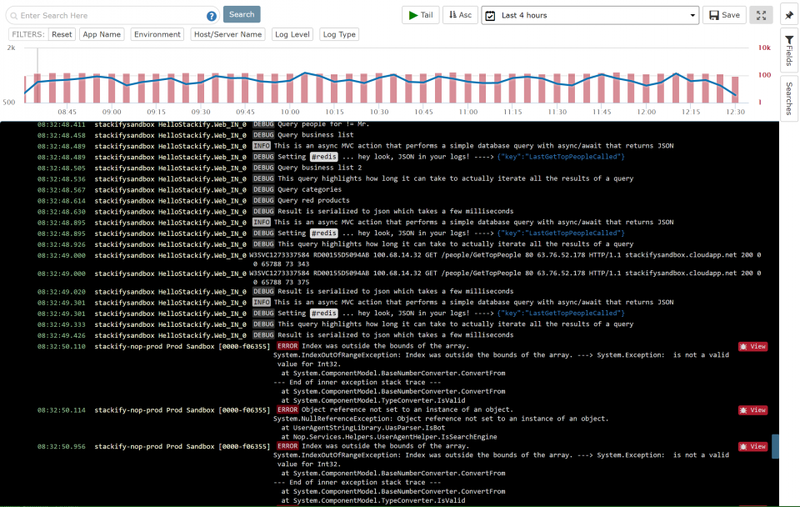 Nothing is more amazing than being able to go from a single log statement to viewing the entire context of the transaction with Retrace’s robust transaction tracing. Retrace makes it easy to analyze mBeans, Performance counters, and even your own custom metrics via our SDKs. With a couple lines of code you can create completely custom metrics in your app. Retrace makes it easy to closely monitor a specific web page on your site, like a login or shopping cart page. You can also monitor the performance of your application as a whole. Several built in dashboards are available. You can also leverage almost any of the data that Retrace collects to create your own custom dashboards. You can even share those dashboards publicly with your coworkers or clients. Retrace is like a swiss army knife for application monitoring. You can monitor your servers, app metrics, app performance, error rates, your logs, and much, much more. Retrace provides advanced alerting and notification capabilities. Alerts can be sent via SMS, email, or Slack. Retrace is bridging code performance data across environments worldwide. No one will ever know these folks make mistakes. That's genius squared! If giving @Stackify a whirl is on your to-do list or something you’d like to try, move it to the top and do it today. 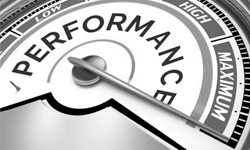 There are APM solutions—and then there are performance tools developers care about. Is it safe to run APM on production servers? Optimizing APM solutions for low overhead makes it safe for them to run on production servers. Retrace is optimized in a major way. How GWB found hidden exceptions and more! Exceptions in .NET can be very expensive when it comes to CPU cycles. 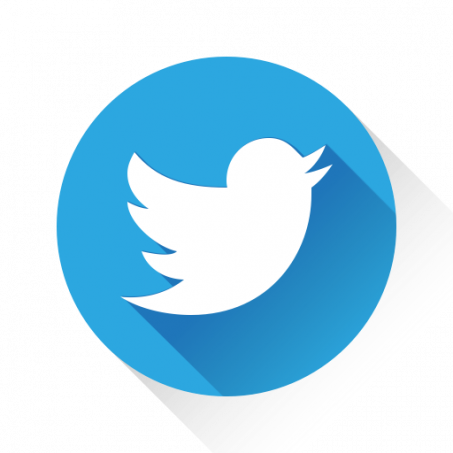 Read how Geeks with Blogs used Retrace to improve app performance. Learn how to set up Retrace to track non web transactions with some minor code changes.